The US military has once again struck a road incident heading to NATO drills in western Poland. A truck reportedly crashed into a road barrier, causing a fuel leak. A soldier at the scene complained that Polish roads are “too narrow” for US vehicles. The incident took place near the city of Gorzow Wielkopolski in western Lubuskie province on Sunday. Lubuskie Police spokesman Gregory Yarashevich confirmed the incident to media, adding that no vehicles besides the US truck were involved. As a result of the crash, the truck leaked fuel on to the road, Bogdan Grabowski from the local firefighting team said. “Polish roads are really good, but a bit too narrow,” Pierce Bak, a soldier from the US Army who was present at the scene of the incident, said as cited by Kontakt24 online news outlet. The military said the Fire Department worked at the scene of the incident, but didn’t say what exactly caused the crash. An investigation has been launched into the incident, the military added. “Literally one of the [US] vehicles didn’t fit into the corner and crashed into the [road] barrier,” Jacek Wójcicki, president of Gorzow Wielkopolski, wrote on Facebook, adding a smiling emoji. “Maybe they [US soldiers] need drivers?” asked one person on Facebook, while another wondered how American troops would fight when they are involved in so many incidents on Polish roads in recent weeks. Earlier in January, a US military truck overturned on a road in western Poland, spilling shells for M-1 Abrams battle tanks. 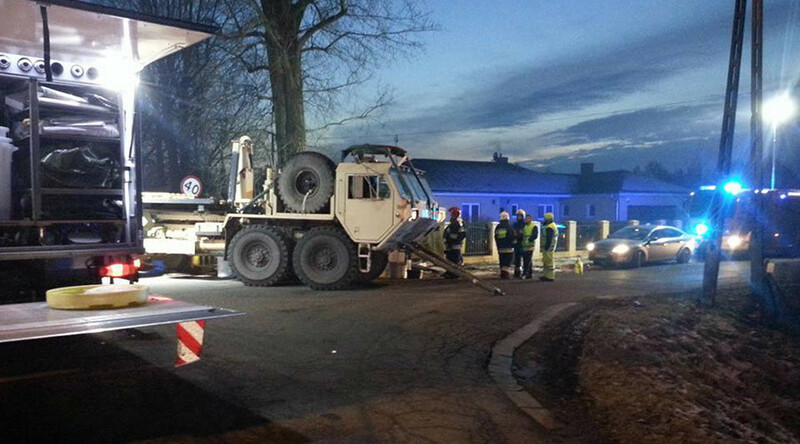 Last week, a US Army truck collided with a civilian bus, also in western Poland, injuring two people. Police explained to local media that a slippery road surface was the cause of the collision. In a separate incident, a US soldier was injured after two US Army vehicles driving in a convoy crashed into each other in southwestern Poland, the US Army said. The incidents come amid the arrival of US tanks and military equipment in Eastern Europe for NATO military drills dubbed Operation Atlantic Resolve. NATO says the buildup along Russia’s borders is a defensive measure to counter the “Russian threat” amid the Ukrainian crisis.